Jump from island to island down the Helgeland coast by express boat and visit the old trading post at Støtt, and the beautiful Lovund island. Be ready for great dining experiences, and an island kingdom you will never forget ! Culinary island-hopping to Lovund island. Number of persons: Min. 2 persons. Transport to/from: By air or train to Bodø. Transport during trip: The Express boat Bodø-Sandnessjøen and the "Trænaruta" express boat. Price includes: Accommodation and two dinners at Støtt. Two nights and dinner at Lovund Hotell. The express-boat transportation between the islands, and to/from Bodø is not included in the price. * Price estimated based on double-rooms. The express-boat "Nordlandsekspressen" runs along the coast of Helgeland between Bodø and Sandnessjøen, jumping from island to island down the coastline - binding small island communities and old trading posts together. This was the main road of the old times. In Bodø you enter the express boat and leave for the old trading post at Støtt. Let the adventure begin ! The trip goes to Støtt - a living fishing village and an old trading place on the Helgeland coast. Today, the island is a living fishing village with fish reception and active coastal fleet. Here Eva Andersen has created Støtt Brygge - accommodation and dining in a very special atmosphere and rich coastal culture. Welcome to one of Helgeland's most exciting islands. Today you will be served a 3 course menu. We can already now reveal that it is about the raw materials of the coast. You wake up at Støtt and spend the day exploring the little island. The island offers excellent hiking opportunities, and possibility for bike and boat hire. Guiding in the fishing museum. After a "fresh" day at Støtt, dinner will be served at appox. 15.30, before you a little after 1700 (about 17.20) again embarks at the express boat and continues down the Helgeland coast. 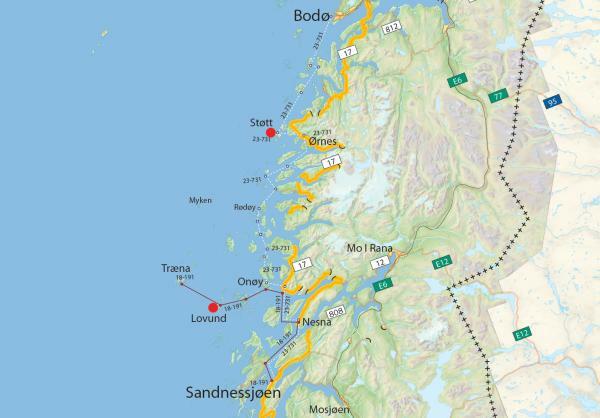 At this stage you pass many classic mountain peaks on the Helgeland coast. First, the "Sugar Loaf" Bolga, then Rødøyløva (the Rødøy lion) and Hestmannen (the horseman). At Onøy you change your boat and finish the last leg with the expressboat "Trænaruta" up to Lovund. You are staying at Lovund Hotell. Welcome to Lovund, the small colorful island. Here you will spend the night in the new signal-built SYN, overlooking the great ocean, sunsets and midnight sun. Regardless of whether you want a big or small meal, Lovund Hotell will do its best to lift the contrasts to accommodate new tastes. The menus are based on local produce from the sea around the island. Lovund offers everything from Lundefugl (Puffin), Ærfugl (Eider ducks), mountain hikes, fjords, bright nights, a lot of weather and a wonderful hospitality. From Lovund you travel the last leg to Sandnessjøen. From Sandnessjøen you can fly home, or take the fast boat back to Bodø. If you want more food experiences along the Helgeland coast, some of the best are yet to come - south of Sandnessjøen. If you want a slightly active angle for the continuation of the trip, you rent bikes in Sandnessjøen and combine Norway's most beautiful bike ride with some of Norway's best dining experiences. Contact us and we will arrange all the practical !